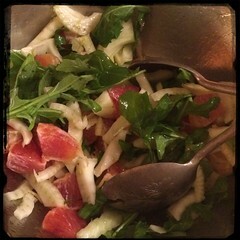 Inspired by Sicilian cuisine this wondrous salad made with blood oranges, fennel and arugula adds a refreshing element to Italian meals. 1. Remove peel, and slice each separated segment into one or two pieces. 2. Slice fresh fennel into 1/4 x 2 inch slices. 4. Throw in extra virgin olive oil, white balsamic, lemon juice, salt and black pepper.